We’d love your help. Let us know what’s wrong with this preview of Encounters by Fred H Rohn. Social mores change from year to year, but one thing remains constant: conflict between people results from differing perceptions, often between men and women and between different generations. In each story, characters confront a variety of personal and professional problems and must either compromise or adjust to new circumstances. In "The Painting," a young married woma Social mores change from year to year, but one thing remains constant: conflict between people results from differing perceptions, often between men and women and between different generations. In each story, characters confront a variety of personal and professional problems and must either compromise or adjust to new circumstances. In "The Painting," a young married woman's deceit catches up to her. "Doc Brunner" tells the story of a pastor facing a series of interrelated problems during World War II. In "Harry," music from long ago evokes powerful memories. Creativity is wondrous gift and one that has no expiration date! This thought came to me whilst reading ‘Encounters’ by Fred. H. Rohn. Fred Rohn came late to writing after a two hugely successful careers in public accounting and venture capital investment behind him. His first book, ‘A Fortunate Life’, was published last year when he was aged 91, followed by ‘Encounters’ this year. I admire and am in awe at the ease he seemed to have entered his third career. Age was no boundary for him, nor for Creativity is wondrous gift and one that has no expiration date! I admire and am in awe at the ease he seemed to have entered his third career. Age was no boundary for him, nor for many other artistic people as he explains in the preface, stating that ‘creativity doesn’t stop as you age’ and Herman Wook still wrote at 102. I myself also aspire and hope to be writing to the last of my days! 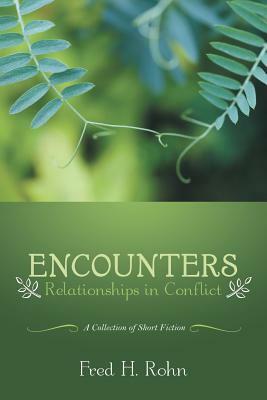 ‘Encounters’ is a collection of stories of varying lengths which explore ‘Relationships in Conflict’. All the stories are brilliantly written and immediately pulled me into their scenarios. I was always intrigued by the seemingly innocuous beginnings, compelled to read on and unravel the lives of the characters. Consequence of one’s action is a theme explored in many of the stories as the conflict is deftly outlined. A conflict often followed by reconciliation. Fred Rohn demonstrates skill in placing the reading in the middle of a scene and gradually letting the story unfurl, mostly to delicious unexpected twists. The first story of ‘The Painting’ highlights many of the writing elements that makes ‘Encounters’ such a great collection. The story begins in the middle of an art show along with an artist called Carrie. This supposedly understated opening quickly becomes a story centred on deceit, and a conflict with no possibility of resolution as Carrie’s actions cause irreparable damage to her marriage. This story, like the majority in the book, is told in the third person. This stylistic technique, which can seem rather distant at times, works perfectly for the stories. Fred Rohn had a particular interest not only in observing and documenting conflict in relationships but also wanted to show an element of reconciliation in some of the pieces. This is particularly evident in ‘Doc Brunner’ which is set in a small town in America during World War II. The era is beautifully captured as is the tension of the society at the time as the pastor becomes embroiled in a fight with the local council and bank in an attempt to save his church from foreclosure. His actions, sometimes verging on those of a showman, win new supporters amongst the youth, especially as Doc Brunner also seeks to ease the town’s restrictive rules regarding their freedom to socially meet-up. There is a quiet, under-stated feeling to all the stories and this is particularly true in ‘Reunion Deals’. Here the sneaky and egotistic nature of Harry Long is brilliantly revealed and one cannot help but be pleased for the long-term deceit he has endured and will continue to experience. A variety of locally divisive issues are tackled by Fred Rohn, and one of bullying is sensitively handled in ‘The Piano Recital’. Where many earlier stories feature adults, here 12-year-old Jeremy Twitchell is relentlessly bullied by Bill Parsons. With the help of a piano teacher, a music concert and a surprise suggestion by Jeremy a rewarding and heart-moving reconciliation is achieved. A few stories centre around the hiring and firing of staff … in itself a most unlikely topic for short stories! However, these are all terrific reads and as usual I was hooked! The lack of empathy and understanding of certain characters is conveyed with expertise. Two of my favourite stories are slightly unusual. ‘Bicycle’ is deceptively simple in itself with hidden depths and is profoundly moving and full of wisdom as a younger brother is helped by his morose older brother. ‘The Old Man’ is uniquely centred on just one character who remains nameless throughout. In a series of everyday situations his confusion, loneliness is shown as he fails to comprehend his own state and merrily signs up for a most unusual course! I am particularly struck by the last two pieces in the book – which I assume are autobiographical. Both these are in the close first person. ‘My Red Bible’ is a personal essay about a red-covered bible which was received on the 17th birthday. This thoughtful and reflective piece takes us from Fred’s travels and musing, showing how important this gift has been to him over the years. Encounters: Relationships in Conflict was an thoroughly enjoyable and thought-provoking read and clearly the result of the author’s long career in business, on boards, and as Chair of the New Jersey Historical Society. His stories cross age groups and are set in different time periods, but all concern the conflict between people based on differing perceptions, and are written with a wisdom that comes only with age and experience. I found the stories oddly soothing and gentle and could directly re Encounters: Relationships in Conflict was an thoroughly enjoyable and thought-provoking read and clearly the result of the author’s long career in business, on boards, and as Chair of the New Jersey Historical Society. His stories cross age groups and are set in different time periods, but all concern the conflict between people based on differing perceptions, and are written with a wisdom that comes only with age and experience. There are many more, but the constant among them is the compromise and adjustment necessary to resolve the problems between two people. Human relationships don’t change in this respect, no matter the time.